We all want our lawns to look their best during summer. This is, after all, the time when our backyards get the most use. It’s also the time when neighbors are most likely to spot issues. In short; getting a beautiful lawn is about as important right now as achieving a bikini bod. But, as keeping weight down is difficult with vacation treats, keeping your lawn in shape during summer can be tough. After all, nature tends to take care of things during winter. Yet, the moment hot weather rolls around, you can bet you’re in for a few unpleasant lawn surprises. By this late in the game, there’s a chance you’ve been battling with your lawn for a few months already. But, if you’ve had no success until now, you’ve come to the right place. We’re going to look at how you can stock a first aid kit which will save the life of your lawn no matter how hot the weather. The first job of any first aid kit is to stabilize the patient for treatment. In most cases, that means administering creams or pills. In the case of your lawn, it means hydration. If your lawn is thirsty, you’ll struggle to have success in any other area. If you’re experiencing a drought, there’s a chance your grass has become dormant to preserve energy. Hence why it’s gone such a horrible color. The good news is, it isn’t difficult to eliminate brown spots in your lawn. All you need to do is get the hose out. Regular watering during the hot weather should be all it takes to return your lawn to its former glory. What’s more, the strength gained from this watering should allow your grass roots to grow deeper. As such, they’ll be able to find water themselves. Bear in mind, though, that overwatering can have the opposite effect and result instead in shallow roots. So, make sure only to get that hose out once a week or so. Once you’ve stabilized the initial issue, it’s time to put a plaster on to help things heal. In the case of your summer lawn, this means turning to something like Banish Weed Killer to keep pesky weeds at bay. The trouble is, once your lawn has enough water to thrive, the weeds will come, too. As such, even a hydrated lawn might not be able to thrive the way you expect. And, given that these spread like wildfire in the summer months, it’s essential you take steps to keep them at bay. Bear in mind, though, that merely pulling these when they appear won’t help your case. Even if you manage to get them at the root, further contamination is sure to follow before you know. To make sure it doesn’t happen, mix weed killer into your water. This stops weed growth at a root level. That then ensures your lawn has plenty of time to heal in the same way that a plaster keeps infection at bay. Of course, a first aid kit wouldn’t be much good to anyone if it merely covered an issue without curing it. And, in the case of your lawn, one treatment won’t be enough to keep issues like these at bay for long. As such, you also need to turn your attention to an ongoing treatment plan you can stick to. When it comes to watering, a fantastic option here would be a sprinkler system. You can set these up to come on at a particular time each week. As such, you can ensure your lawn gets regular watering whether you remember it or not. 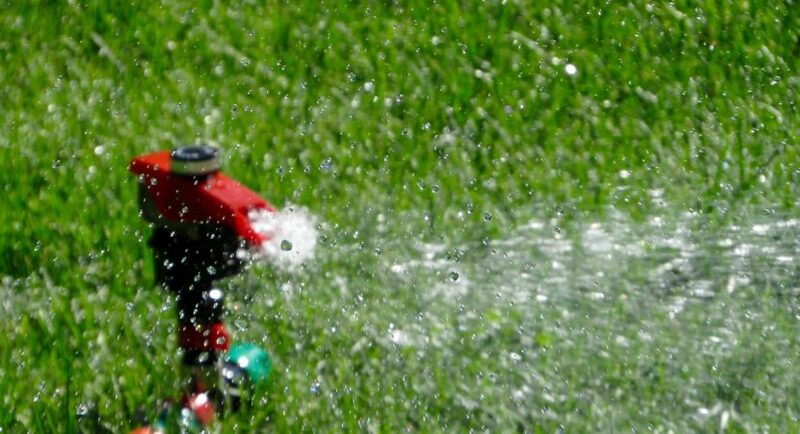 During hot spells, increase the time these sprinklers come on so that your lawn always receives the water it needs. If you don’t fancy that, develop an ongoing watering schedule, and make sure you don’t get off-course with it. When it comes to weeds, your best bet for keeping them at bay is to use a mulching lawn mower. These cut grass and then relay it straight onto your lawn. By doing so, grass clippings can break down to provide added nutrients to your yard. By laying atop your soil, mulch can also act as a protective barrier to stop weeds from gaining root. What’s more, this is another step which you don’t need to think too much about. All you need to do is invest in a mulching mower to use for the rest of the season. Admittedly, you can turn those sprinklers off the moment the dry spell is over. In fact, it’s best you do given that overwatering can prove equally damaging for your lawn. It’s also not good to mulch all year round. Once the hot weather starts to wane, doing so can inhibit lawn growth. So, even once your medication has done the trick, turn to preventative measures to ensure issues don’t arise again. The good news is, there are a few different options you can turn to here. For one, lawn aeration can create holes in your soil to keep your lawn healthy. This ensures water reaches the roots, as well as ensuring adequate drainage. It’s the best of both worlds. When it comes to weeds, the issue is a little easier to manage in the long-term. For the most part, weeds stop spreading once the cold weather sets in. But, if you want to make sure, sticking to a proper mowing schedule should do the trick here. Not only does mowing keep your lawn healthy, but it also stops weeds in their tracks, especially towards the end of summer. Just remember to put that mulching mower aside and turn to a traditional option when the weather changes! Then, get into the habit of a regular mowing schedule. On average, getting stuck into this about once a week should be all it takes to do the trick. While this won’t kill weeds, it will stop them from taking root and stealing all-important nutrients.